I offered to throw my sister a baby shower the second she announced her pregnancy. I love her. I love babies. I love parties. I love planning. I love being in control. This seemed like an obvious decision. The one problem is I have never planned any type of shower, but with the invention of Pinterest basically any person with a pulse can plan a party. I browsed Pinterest for weeks before deciding on a “shower” theme, as in “rain showers”. Thank you fellow pinners. 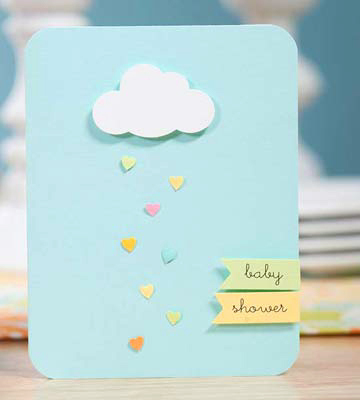 My first step to planning the perfect baby shower was creating the perfect invitation. I found this invitation on Pinterest, and decided it wouldn’t take to long to create these. I decided to make them over the Christmas holidays, December 29th to be exact, and mail them no later than December 31st. No problem, I can handle 70 something invites in two days…. Wrong. Punching out exactly 4 million hearts, cutting 9 thousand clouds, and assembling everything took WAY more time than I ever could have fathomed. Lucky for me I have the world’s best friends. Husband, Steve, Derek, Zoey, and myself worked together to get the job done. I did not have to ask one of them to help. Nope, each one of them willingly offered to help simply because they are my friends. I am oh so so so grateful to have friends like them. Our plan was to work until midnight, get up early (breakfast on me), and spend the next day finishing. However, once we got going we couldn’t stop. We stayed up until 6am finishing every single invitation PLUS their envelopes. The secret to our endurance? Hot fries (duh), Monster energy drink, and jalapeno flavored Cheetos. Yes, spicy junk food and caffeine does the trick. Didn’t they turn out great? One small request that won’t be too hard, please bring a book instead of a card. Whether the cat in the hat or Winnie the Pooh, you can sign the book with a note from you! Baby Boy will become very smart indeed, if we start early he will soon learn to read. She got a ton of books BTW! Thank you so much Husband, Zoey, Steve, and Derek! Wow, I’m so impressed and grateful. Hil you are too amazing girl:). And thanks to everyone who helped with the invitations…they were adorable…loved it!!!! Thank you! I really enjoyed putting everything together, and I’m just so happy you enjoyed it!